Guest blog by Anais R. check her out on Facebook. 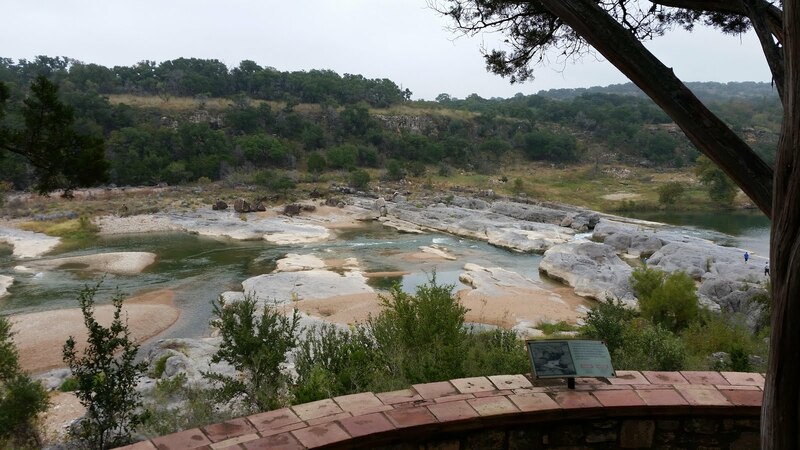 As some of you know this wasn't our first trip to Pedernales Falls, so make sure to check that out. 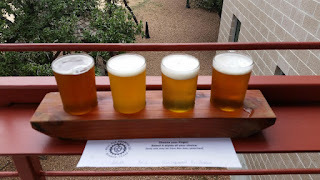 A few Saturdays ago, November 5th, found me on a day trip to Pedernales Falls State Park and Real Ale Brewing Company. I went with a friend on this one instead of my dog, since the dog doesn't really appreciate beer the way I do. 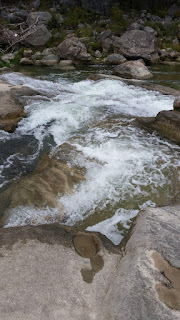 We got to Pedernales Falls State Park around 9:30am and since we only had a couple of hours to hike, headed straight up to the Pedernales Falls Trail System to start. The weather was perfect and stayed right around 70 degrees the entire time, although it did start to rain as we were leaving the park. We walked the trail a few minutes to the Falls Overlook and then descended to actually hike over the rocks surrounding the falls. It was pretty quiet at first, but within the next 30 minutes or so the place was overrun with families, Cub Scout packs, and obnoxious fitness couples in matching spandex suits. You know the ones I'm talking about. We hiked over the rocks up to the start of the falls and then back down to where the water pools before continuing its course down the river. This is my absolute favorite terrain to hike. I love the close proximity to water here. 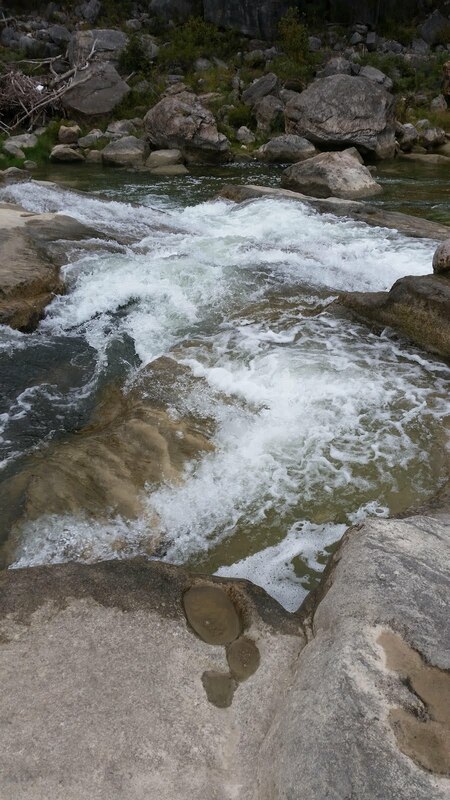 There is nothing better than hiking with the soothing sound of flowing water in your ears. I also love that you can make it as adventurous as you want by climbing over and through rocks instead of just walking around them. Unfortunately for me, I went on this particular adventure with a hiking buddy who refused to climb, jump, crawl, explore, or do anything other than just walk. Oh well. After about an hour we had had enough of spandex couples and screaming children and headed back up to hike the less popular wooded trail away from the water. I missed the sound of the falls, but it was nice to have a little more peace and quiet. The trail was a little muddy from recent rain, but nothing unmanageable. 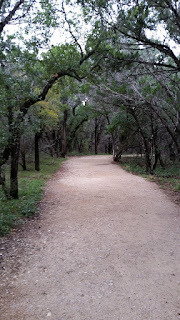 We walked for about 30 minutes among the quintessential Texas greenery (aka all the plants that want to hurt you) before we had to turn around and head back to the car. It was a nice short, easy hike, but next time I would definitely go a little earlier, plan to stay a LOT longer, and choose a buddy who is looking for a little more of an adventure than just a nice walk. 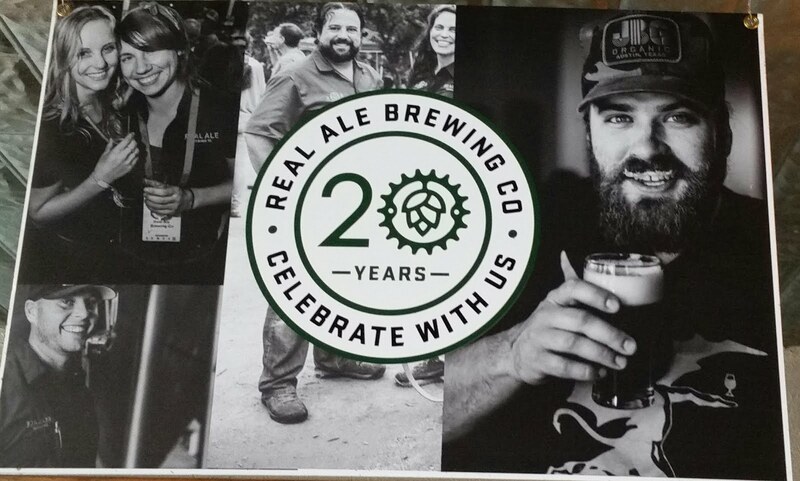 Back to the car and on to nearby Blanco to check out Real Ale Brewing. I have visited and toured several breweries in Austin over the past few months and wanted to venture a little a little farther away to one that I thought would be worth the trip. We arrived right after noon, with just enough time to try some beer before the 1pm tour. I opted for a flight, which included four small pours of my choice. I was a little disappointed with the selection they had on tap since it didn’t include the two beers I had really been hoping to try. So, I went with the VolXX, Axis, Four Squared, and Rio Blanco. Let’s just say I was unimpressed. I am certainly no professional, and I have my likes and dislikes to be sure, but I like to think I’m pretty open-minded when it comes to trying new beers. These were not great. The VolXX was hard to finish. Definitely my least favorite. I’m not even sure how to describe it. Just bad. Rio Blanco was okay, but when it comes to pale ales I have definitely had better. Four Squared was a hoppy, slightly fruity taste that I could like in small amounts, but probably only in small amounts. The Axis was definitely my favorite. It was a light, citrusy IPA with an ABV of 7.0%, which may or may not have contributed to my enjoyment of it. The building and atmosphere were great though, and almost made up for what the beer was lacking. The taproom itself was beautiful with plenty of room inside as well as a large patio balcony outside overlooking a nice picnic area where you could bring your own food or buy some from the food truck parked close by. The scheduled tour of the brewery was underwhelming, even while being slightly tipsy. Although it was free, the guide didn’t seem to know a whole lot about the brewing process and conveyed what he did know with relative disinterest. I would have preferred to pay a few dollars in exchange for a little enthusiasm, but I guess you can’t have it all. Overall, it was a fun day trip, not too far to travel and I enjoyed the combination of the brewery and a hike. Now I just need to find a brewery in the woods that you have to hike to get to. That way, even if getting there is unremarkable, you’re at least guaranteed to enjoy the hike back! Pedernales Falls is great park, one of my favorites in Texas. I would love it they added some more trails and linked them all together for an awesome backpacking experience.